Photo copyright Hilton Hotel Auckland. 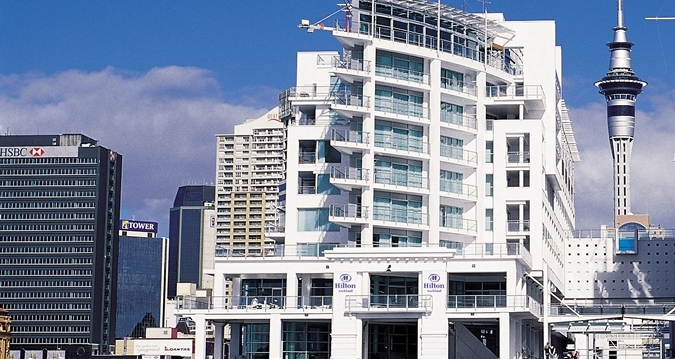 Located 300 meters out to sea at the end of Princes Wharf, the Hilton Auckland hotel is a welcoming haven just a short walk from Auckland CBD. Enjoy stunning views from this Auckland hotel's White restaurant and Bellini Bar or take a dip in the outdoor heated lap-pool with its unique underwater viewing window. Auckland attractions such as Sky City Tower and Viaduct Harbour are on the doorstep. Enjoy modern fine dining in the stylish decor of White restaurant and sip cocktails over a harbour sunset at the Hilton Auckland hotel's Bellini bar. Only 5 minutes' walk from the business district, the Hilton Auckland hotel has a business centre, an Executive Boardroom and 7 meeting rooms for up to 400, all with wireless internet access.